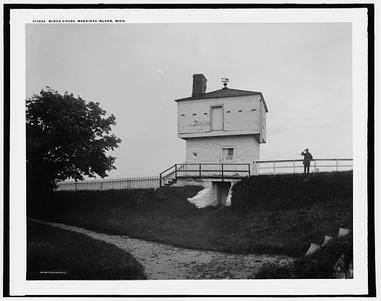 Block house [Fort Mackinac], Mackinac Island, Mich., Detroit Publishing Co., circa 1890, Library of Congress. On a temperate day during the Spring of 1895, the last twelve soldiers assigned to Fort Mackinac made their way off the island. There had been a military presence on Mackinac Island since July 1815, but they were no longer needed. Duties for soldiers had gone from patrolling the lake and keeping guard of the northern border to patrolling the national park area on the island and keeping tourists from damaging the land. What was once a strategic position for military operations became a place for tourists to enjoy nature and all that the island had to offer. Mackinac Island was our nation’s second national park, but is often glossed over in history because it lost its national park status. Mackinac Island was the site of a battle during the War of 1812 between the British and United States. The United States was defeated in this battle and subsequently left the island. However, ownership of the island was given to the United States through the Treaty of Ghent and quickly occupied by troops in July of 1815. With no war to fight, the island and Fort Mackinac was used as a military base for both the 22nd and 23rd Army Infantry divisions during its time of military occupation. Here, troops could be stationed and quickly deployed to other areas of the country where they might be needed. Hon. 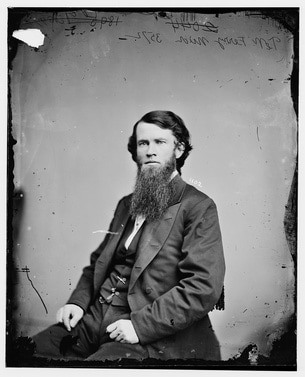 Thomas White Ferry of Mich., photographer unknown, circa 1860, Library of Congress. Shortly after the Civil War, the island location was no longer necessary as a military staging post and the non-military areas of the island had become a popular summer destination for visitors and tourists who traveled from nearby Midwestern states. In March of 1873, a resolution was introduced to make Fort Mackinac a national park. The senator behind the resolution was Mackinac Island native Thomas W. Ferry, the son of a missionary. Ferry had fond childhood memories of his time living on the island and wanted to preserve it for future public enjoyment. As was the case with Yellowstone, Ferry had to first prove the land was devoid of any type of economic benefit to the government. He argued that the island was no longer needed for national security and that the location was ideal for tourism. Unlike Yellowstone which was expansive, but relatively inaccessible, Mackinac was much smaller in size and had already been attracting middle and upper-class visitors for years. He believed that national park status would “simply enhance the island’s reputation as a resort and put lands that were already under governmental control to the ‘useful service’ of cultivating national pride.” This governmental control of land also meant that it would cost next to nothing to change the land over to a national park. Army soldiers were already caretakers of other national and state parks, so it would be easy to have them continue to care for island should it be granted national park status. The Engineering Bureau within the War Department agreed, expressing that, "In a time of peace, we cannot conceive of any combination of circumstances that would require a garrison of more than two companies at the post. Therefore, there can be no objection to such dedication." Grand Hotel, photographer unknown, 1890, GrandHotel.com. Though Mackinac National Park was small in size and had its fair share of summer tourists, the undoing of the park came back to the reason it was able to obtain national park status in the first place – funding. Like Yellowstone, funding for park upkeep and maintenance was not provided by the government and the War Department would only provide enough funding to cover the fort and soldiers. Mackinac National Park’s supervisor was also the commandant for Fort Mackinac and he tried to raise funds in many ways to maintain the park. Land was leased to private owners to build cottages while an adjacent area on a nearby island, owned by the government, was put up for sale. Nevertheless, these attempts were all for naught as they simply did not provide enough funds for park maintenance, such as enforcing island rules during tourist season, general year-round upkeep of roads and trails, and repairing damage from acts of vandalism. Map of Mackinac Island, Michigan, Lt. Dwight Kelton, 1887, Annals of Fort Mackinac. By the early 1890s, the Army was beginning to reduce the manning at certain posts and personnel were needed elsewhere. In 1894, Secretary of War Daniel Lamont brought the final blow to Mackinac National Park and decided that he could no longer justify appropriating government funds from the War Department to Fort Mackinac. Secretary Lamont’s view was that the costs to maintain this post, including salaries of soldiers and all incidentals, some forty or fifty-thousand dollars per year, was unnecessary as the soldiers were practically lost to the military department. The situation seemed to be that the Government was expending this large sum yearly to maintain a place only for the summer homes of a handful of families and seasonal tourists. Lamont felt their presence on the island was wasteful spending, so soldiers were transferred to other posts off the island, leaving a group of twelve as caretakers. ​By 1895, Congress realized that twelve men could not offer effective protection for the national park or Fort Mackinac and indicated that the army could not continue to manage the park in the future. The decision to relocate the soldiers and close the fort meant that Congress would need to establish and fund a civilian ranger force should they decide to keep Mackinac Island as a national park. Rather than provide funding for this, Congress decided to remove themselves from all responsibilities regarding the island. This worried local citizens as they did not want the land to be sold to private interests. Michigan governor John T. Rich suggested that Congress turn the land over to the State of Michigan, allowing the island to become a state park. Congress agreed and the State of Michigan took charge of Mackinac Island State Park in May of that year, with the fort and island preserved under the condition that it remain a state park, or the land would revert to government property. Kathy S. Mason, Natural Museums: U.S. National Parks, 1872-1916, (East Lansing: Michigan State University Press, 2004), 31. “Washington Notes – The Mackinac Island Park Scheme,” The New York Times, December 19, 1873. “Mackinac – A Thanksgiving Day: Correspondence with the Detroit Post,” Isabella County Enterprise, March 24, 1875, 4. “The Abandoned Army Posts: Protests Against the Recent Order of Secretary Lamont,” The New York Times, October 8, 1894. Janiskee, Bob. “Pruning the Parks: Mackinac National Park (1875 – 1895).” Last modified May 10, 2011. Accessed February 25, 2017. http://www.nationalparkstraveler.com/2011/05/pruning-parks-mackinac-national-park-1875-18958079. Kelton, Dwight H., Annals of Fort Mackinac. Detroit: Detroit Free Press Printing Co., 1887. Mackinac Parks. “Fort Mackinac and the Mackinac National Park.” Last modified January 22, 2016. Accessed February 24, 2017. http://www.mackinacparks.com/fort-mackinac-and-the-mackinac-national-park/. Mason, Kathy S. Natural Museums: U.S. National Parks, 1872-1916. East Lansing: Michigan State University Press, 2004. National Parks Service. “Preserving Nature in the National Parks: A History.” Last modified January 1, 2003. Accessed February 26, 2017. https://www.nps.gov/parkhistory/online_books/sellars/chap1a.htm.